Homepage. 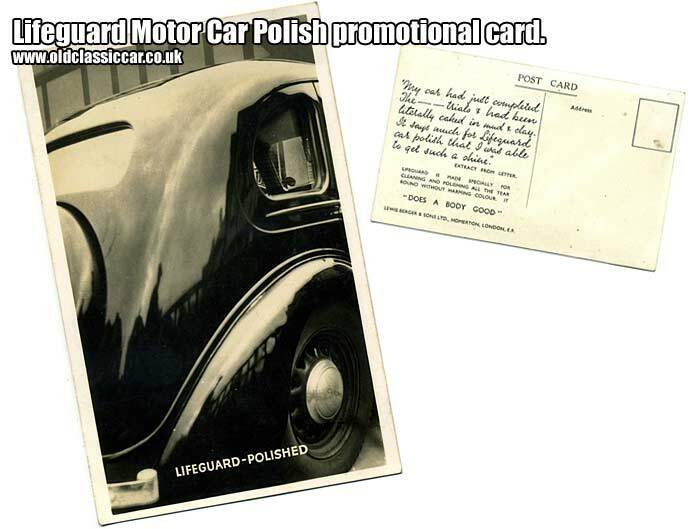 This page: Probably dating to the late 1940s, an original promotional postcard for Lifeguard motor-car polish. Still little items of motoring ephemera turn up, and here it's the turn of an old advertising postcard for a brand of car polish. Lifeguard, which "Does A Body Good" we're told, was produced by Lewis Berger & Sons Ltd, a firm now known for its paints. It shows a rear three-quarter shot of a shiny black Standard, probably a Flying 10, which has received the Lifeguard polish treatment. Despite the paintwork glistening as you'd expect, the hubcaps look surprisingly dull, as if they remain untreated. Perhaps the chromework was beyond salvation, but if so I'd have though they'd show a different car. The wheels too look quite dirty, again a little surprising. "My car has just completed the - - trials & had been literally caked in mud & clay. It says much for Lifeguard car polish that I was able to get such a shine." The type of car the correspondant had been competing in isn't mentioned - or is the Standard the car that the letter refers to? We'll never know. If anyone has a vintage tin of Lifeguard polish, it'd be interesting to add a photo of it to this page if possible. Perhaps better known for its range of polishes is Simoniz.